JD SUP is revolutionizing the way we think about paddle boarding. 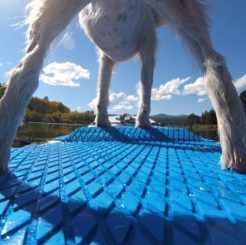 Our inflatable paddle boards, some equipped with a unique paw perch, are made to support you, your dog, your kids, and your lifestyle. We’ve crafted four different boards based on your perfect paddling experience. Our unique Paw Perch makes the perfect place for your K9, or kid, to rest while you explore the open waters. All of our inflatable paddle boards are equipped with innovative retractable fins. Fins retract on contact with an outside force so your fins won’t break and your board won’t get stuck. Fins are attached to the hull to have constant contact with the water and keep the board moving in the right direction. Unfortunately, most fins break on impact when hitting a rock or other hard object whether on water or during transport. Repairing an inflatable board after a break is expensive and risks water permeating the inside of the board that needs to stay dry, resulting in water damage that can be impossible to reverse. 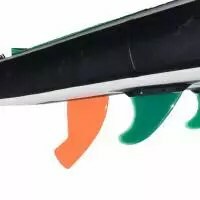 Retractable fins reduce damage without sacrificing the stability associated with removing the fins altogether. At JD SUP we strive to craft new, fresh ways to explore and play in the great outdoors. All of our inflatable paddle boards feature innovative ergonomic shapes to take you to the next level of paddling. Our boards feature industry-first designs that maintain the performance and functionality needed to paddle however you please. Our double layer core technology uses a thick second layer of liquid PVC poured over the raw drop stitch material to create high wear-resistance for your most rugged adventures. Lean, mean, and tenacious, new fusion technology allows us to use less material than traditional boards while maintaining durability. These babies are best of both worlds: streamlined and strong. For those who enjoy long expeditions and journeys far and wide, we’ve constructed our Touring inflatable paddle boards for the explorer in you. Score wild rides and big air on our original Freestyle board, designed to help riders perform tricks with an innovative twin design, added handles, and a collapsible fin. Designed and shaped for stability, balance, and grace, this lightweight Yoga board is perfect for finding your center on water. JD SUP is revolutionizing the way we think about paddle boarding. Our inflatable paddle boards, some equipped with a unique paw perch, are made to support you, your dog, your kids, and your lifestyle. We’ve crafted four different paddle boards based on your perfect paddling experience.